What are the pros and cons of outsourcing technical documentation? What are the advantages and what are the disadvantages when software documentation such as user manuals, online help, or screencasts are created by an external service provider or contractor? Is it possible and does it make sense to outsource the creation of technical documentation? At a first glance, the rates of an external documentation service provider may seem high. However, you only have to pay for the productive time that was actually spent on the product, instead of consistently paying a permanent employee. There are no ancillary wage costs such as social insurance contributions, sick days, vacation, training, etc. In most cases, you also save the cost for a workplace at your company, including special software. The bottom line is that a documentation service provider is rarely significantly more expensive than an employee. In addition, you have much more flexibility in times of unsteady workload. Of course, every new contractor will have to learn a lot about your products and about your clients. This will take some time, but it also has a major advantage: No one will be able to produce technical documentation that’s more user-friendly than somebody who has to learn the same things as the user. Permanent employees will take many things for granted that aren’t obvious to users. 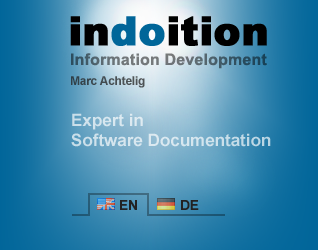 Documentation written by an insider often lacks vital information and can thus be hard for novice users to understand. Of course, your management times must be taken into account for your individual cost-benefit analysis. No documentation project will go without planning, meetings, interviews, and reviews. However, bear in mind that most of these tasks are exactly the same when a company employee writes your documentation. Yes, there is some risk. But isn’t the risk with “permanent” employees just the same? They, too, can become ill or leave the company. The important thing when charging an external documentation service provider with creating your documents is that you reserve all rights regarding templates, style sheets, texts, and source code (especially in the case of online help / online documentation). All processes should be designed in such a way so that they can be mirrored in your company. This means: All documentation processes should be documented. Only software should be used that you can easily license. If any custom software is involved, this software should be sufficiently documented and should be available for use with an appropriate license. As you can see, most doubts aren’t without reason. However, if you choose your contractor carefully, the advantages will often outweigh the disadvantages. A lot of start-up and small- to mid-sized companies don’t have their own documentation department. Documentation is written by developers, by support staff, by product managers, or by marketing professionals. However, in most cases, these people don’t have much training and experience in writing user manuals and help files. Also, many of them don’t like writing documentation at all. An external documentation service provider is a specialist in this field and can produce better quality in less time. Typically, with every new product release, documentation departments face a tremendous workload. Using external documentation services can increase your flexibility and reduce time to market. Often, developers, product managers, or marketing professionals are expected to produce technical documentation or online help in addition to their usual work. This drains valuable human resources. Outsourcing documentation gives people back the time to focus on their core tasks. No one can be an expert in every field. Tasks that require special skills can be performed much more efficiently by a specialized service provider. The more you become involved in a project, the more difficult it becomes to critically reflect on things and to work out ideas for improvement. For an outsider, this is much easier.